Since the turn of the millennium we increasingly realize that patients should be treated in a holistic way, which in particular includes their life conflicts. The analysis of the periodic table of elements by JAN SCHOLTEN  opened the way for a new kind of classification and repertorisation of homeopathic remedies. The single elements of the PT represent life themes that are not managed by the patient. Thereby, group analysis (resorting to series and stages) makes precise prescriptions possible. 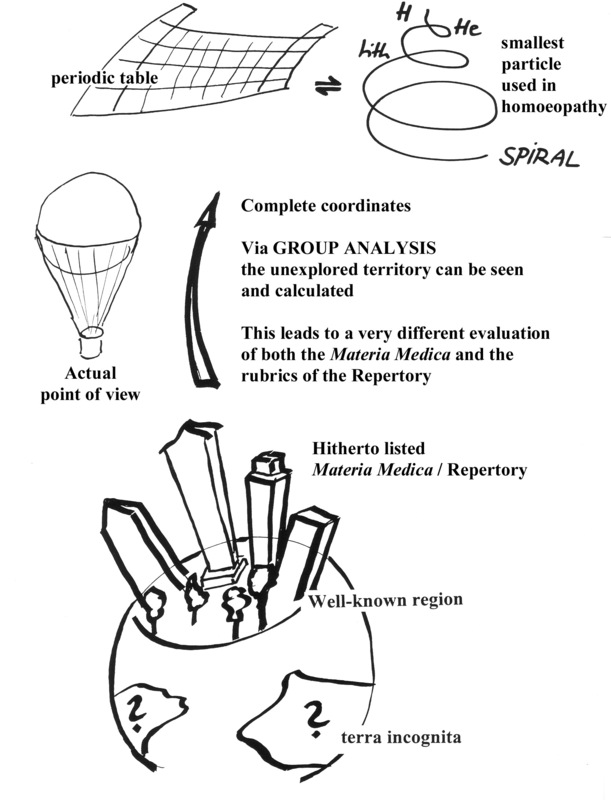 Even unknown and unproven remedies can be understood in their essence and used in the prescription by group analysis. This approach yields striking results even in severe cases. "There is a question arising: are we limited by remedies that are well proofed as nat-m, nat-c and nat-s or are we today in a position to go further by the method of group-analysis to understand also nat-f, nat-i, nat-nit etc which have the same importance but are not or are not well-proofed ." If one grows up in a certain district, let us say in New York, one knows this area very well, one knows the buildings and the places, the factories, the streets, one knows some part of the landscape of that city. If one takes a balloon and goes higher, one can see the surroundings of this area where one lives – one can see not only the well known buildings, in our case, lets say: nat-m, nat-c and nat-s, one can also see that nat-f and nat-i do exist as well – and yet, these latter components not only should to be integrated into the Materia Medica, they have to be integrated for scientific reasons. "N. Y. is a good place for our description, because the well proofed remedies are in a way as the skyscrapers and they are build on granite. To a certain extent the Materia Medica and the repertory are very concrete and precise – and durable." If one takes a plane or a satellite and goes higher, one can get the coordinates of the whole planet, one can even measure the ”terra incognita” – in other words one can see the relations of the different elements. From this moment on we have the complete coordinates of our planet – or here, in our case, the coordinates of our Materia Medica and at the same moment we gain insight into the terra incognita and the relationships between known, partly know, and even unknown remedies. The coordinates for the elements (and minerals) are represented in the PT. We not only have a cartography of particles, but also have a cartography of the smallest particles, namely atoms and molecules which are today well known in physics and chemistry. "We are now in the position to use the hierarchic order of a system preformed by nature and have the interpretation of this hierarchic order up to the essences of the elements. In this way, this system is an outstanding tool, high in rank and of upmost importance for homeopathic prescriptions." "Hitherto, only a few fragments of such characteristic traits of a particular medicine have been discovered. The principal symptoms are, moreover, in many instances incomplete, and in many others perfectly false; and can only be known with certainty, and have their due value assigned them, by careful study of the various medicines, having especial regard to their relations one with another. A mere acquaintance with these principal symptoms cannot be called studying the remedies; If we were in possession of a scientific arrangement of the Materia Medica, we might make it the basis of our study of the medicines; but at present we cannot except to construct anything satisfactory on such an uncertain and incomplete basis. He who seeks to study the medicines according to their symptoms, but each medicine separately, and without instituting a comparison between them, will, with the very best memory, not advance far before forgetting, what he had previously learned. The memory is incapable of retaining anything but what is presented to it in connection with something else; an idea is easily brought to the recollection only when in connection with others. (We would remind him who has no experience in the comparative method, either on himself or others, that acquiring a knowledge of the symptoms of medicines is exactly similar to the mode in which the chemist, the mineralogist, the botanist, and the zoologist, acquire a knowledge of the objects connected with their respective sciences. We should, therefore, set about it in a similar manner. Let it be considered what a multitude of signs are so perfectly at the command of the zoologist, that he can easily recall them to this recollection). The zoologist can at once tell a new animal when he sees it; can instantly determine to what class it belongs, and point out its particular characteristics. By merely looking at each animal, he already knows its characteristic peculiarities. In the present state of the natural sciences, all the relationship existing among the various classes and orders may be seen at a glance, the study of them thereby greatly simplified, but as we have not brought our Materia Medica to such a pitch of perfection – and from the short time of its existence, it was impossible to advance it further than it is at present – we must still dispense with this simplifying glance. Until that time comes we must study the remedies as we find them; the time is we hope not far distant, when we shall be able to talk about the objects of our science in the same manner as natural historians do of theirs; when, like them, we may be able to give complete descriptions of these objects, without touching upon the unimportant matter; the time, we hope, is at hand, when we shall know what is and what is not important in our Materia Medica”. These are HERING’s words about 100 years ago. Today we are going to integrate this very important aspect looking at the remedies in comparison, so far for the minerals. • The CARBON-SERIES represents the ego and the self-worth of a person. • The SILICA-SERIES represents the relationships, you and I and the capacity of making contacts. • The FERRUM-SERIES represents work, routine work, tasks and duty. They want to be correct, they want to be perfect and try to control; on the other hand they are afraid of failure. • The SILVER-SERIES (Argentum) represents art and science; this means also the ideas a person is able to bring to other people. Here we find the artists, the writers, the composers, the painters, the scientists, even top sportsmen. • The AURUM-SERIES represents leaders and managers, kings and politicians, individuals who are able to start and organise large projects and who are able to lead people and be responsible for the people and for the projects. Let me display an example of development, peak and decay. I’ve chosen the series of relationships, the SILICA-SERIES, because here we’ve well known remedies. In the beginning of this series there is NATRIUM, which stands for impulsive and spontaneous contacts, contacts that are in some way naive and simple and have to be finished, so finally these natrium-minded people are often found left alone. 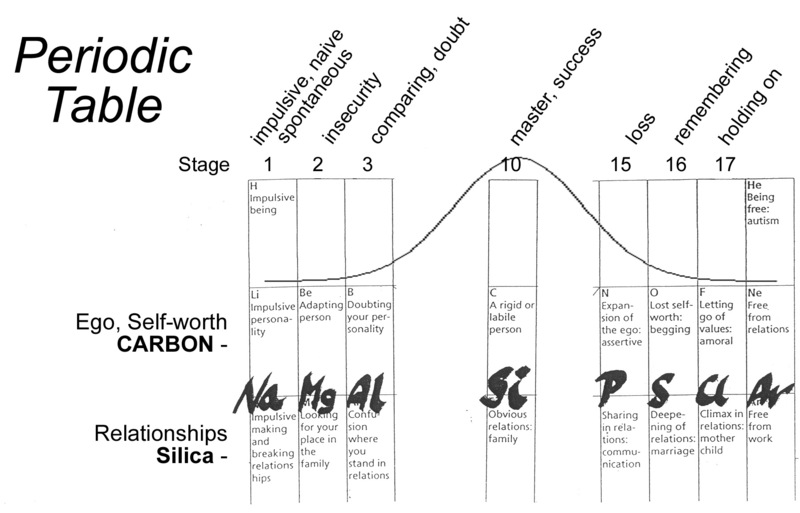 SILICA represents the peak of this series: here is the family, the structure, organisation, and character of the family; blood-relationships; the image, the father is the corner stone of the family. And MURIATICUM, the end of the series of relationships, has still a great desire for contacts. The mother-child relationship is the strongest symbol for MURIATICUM, a connection that is intense and very essential for some time, but has than to be ended. We have symptoms as care, nurturing and self-pity, they give the impression of moaning and complaining. This is an example of development, career and decline of the themes of the series, here for the silica-series, here for the theme of relationships. The following case should give insight into the method how to use the periodic table to indicate mineral remedies. It is of course a conditio sine qua non to study the meaning of health and illness concerning the series and stages. In order to get a vivid idea of the various themes, the best way is to visualize the system, to become empathetic with its contents. This case1 should give insight into the method using the periodic table in order to find out the corresponding mineral. It becomes clear that the proofing of remedies only provides an incomplete drug picture. However, via abstraction and property of similarities, the essence of a remedy can be found. In autumn of 1999 a 29 year old man suffered from some neurological symptoms mainly with regard to the memory of words and discrete epileptic symptoms. An astrocytoma grade II, was diagnosed. Craniotomy followed, parts of the tumor were removed. A second operation was performed at an university clinic on 14th of Nov. 1999 and again parts of the big tumor were resected. At this stage the tumor has reached grade III. 21st Nov. 1999: The MRI shows a rest of the tumour extending to the temporo-occipital and parietal region, partly infiltrating into the Corpus callosum, the Insula and the lateral part of the basal ganglions as well as the Capsula interna. The patient takes cortisone, carbamazepin, and other medications. Chemotherapy and radiation followed. The radiation was so severe that the left side of the head and the face, mainly the ear, was burnt so badly that it seemed as if the patient had slept on a stove. Cantharis C30 (1-3 times daily) and other remedies, as well as a treatment with the flame of a candle2 brought about a regression of all side effects caused by radiation. During chemotherapy he took Okoubacca C6 (2-4 times daily) and for months both Radium bromatum C18 and C30 when the patient was restless (warm baths brought relief). But what about sufficient homeopathic treatment? Is there a deep-acting remedy to be found? I met the patient for the first time in December 1999 together with a relative. By that time he was undergoing both chemotherapy and radiation. With regards to the severity of his situation, he was in a rather good condition. He was very slow in answering, but his relative gave me a good outline of his life. The patient had great troubles with his family, and over years has struggled with his girlfriend. Finally the couple separated and he took over responsibility to care for their child. He has to care for the child and lives in a flat in the same house as his parents, where his mother actually takes care of the child. Concerning his business, he is in a leading position but is also closely tied to the enterprise of his father. Of course there is some tension within the family, but he has adapted to the situation and accepts being dependent on the family and lives in close connection with them – whereas his brother has separated from his family, is married into a distant city and has not spoken to his father for years - a striking aspect! The only prominent symptom to explore on a physical level regards a swelling of the lymph nodes in the cervical region, which dates back to several years. The patient is in a leading position of a company and has narrow ties to the company of his father. In addition, he took over the responsibility to care for his only child. However, these are only a formal aspects (SCHOLTEN), because in fact he can not care for all this, he is totally dependent on his parents. 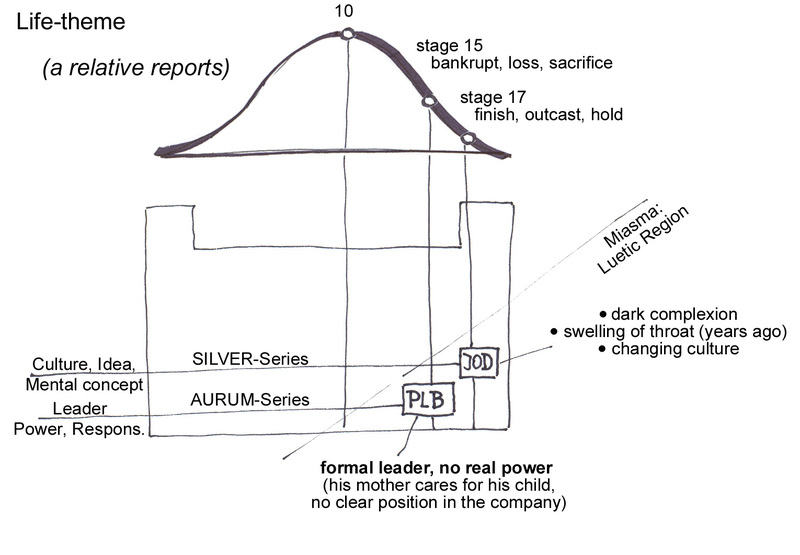 In my opinion he is a leader, a manager with a formal status, without power; this is Aurum-series, stage 14, Plumbum. At this point, I would like to mention a very interesting Repertorium concerning tumor-cases, which I consider as very important. It was compiled by the Indish homeopath P.S. KAMTHAN . Therein, he describes nine remedies one should think of when dealing with brain tumors: Calc, iod, lach, plb, thuj, bar-i, phos, cann-i, tub. Among them, Plumbum is listed as well as Iodine. Thus, both elements out of nine remedies should be taken into account when dealing with brain tumors! The second element besides plumbum may here be iodine. Are there specific symptoms indicating iodine? On the physical level, there are no striking symptoms other then swelling of the lymph nodes that date back to several years. The constitution, the complexion of the patient is rather dark - and KAMTHAN, a very experienced homeopath, suggests to think of iodine concerning brain tumors. Iodine has a sykotic-luetic trait and contains the following message (theme): He must change his mental concepts, he lives in a wrong "culture", the conditions are not right, he should go away or alternatively must completely change his thinking. These are the most striking items that point to Plumbum iodatum. The remedy in this case is Plumbum iodatum. Plb-i was administered in C 200, sometimes twice a day, followed by FC 1M3 once a day, then FC 5M sometimes every third day – each dose carefully adapted to the effect of the given remedy. It relieved all the patient’s pain, foremost the intense stitching pain in the right eye. (A computer search program gives more than 300 remedies for stitching pain in the eyes and more than 100 remedies for stitching pain in the right eye – all the efforts to find the remedy via the computer were not successful. In this case the computer was of no help because of lack of information, as is often the case). The auras and the epileptic attacks decreased. The pains gradually disappeared. The cramps in the region of the scar subsided partially after doses of strychnine C 12, C 30 or C 200 up to twice a day when the cramps were strong. On the basis of a MRI examination another operation was discussed in March. A repeated investigation six weeks before the scheduled operation showed that the tumor along with the peripheral edema has decreased in size and there were no signs of progression. No operation took place. The patient recovered very quickly and was able to pick up his child from kindergarten. He refused to undergo another cycle of chemotherapy because of straining side effects experienced previously. Besides he was confronted with the question that chemotherapy in his case is rather palliative, he decided to have further homeopathic treatment. He then decided to have a vacation in an Italian resort. At that time we had daily phone calls for six months, however, at the beginning of the treatment the contact was mainly via his relative, this even meant three telephone consultations per day. In case it is of interest, Arnica C 200 was given daily for some days following the operation. Radium bromatum was given at night when the patient was restless, Strychnine in rather low potencies helped to relieve the cramps in the region of the scar and Cantharis C 30 helped to cure radiation burns. The various remedies were even given on the same day, but each remedy was prescribed based on prominent symptoms. But the main remedy that should lead the cure was here administered in high potencies, because the patient was in good condition and was able to endure severe therapies (surgery twice, radiation, chemotherapy). He was hopeful and attempted to become reintegrated into normal life. During the last weeks the patient came to consultations on his own. During autumn of 2000 and in spring of 2001 the patient was no longer so heated, he was rather chilly. He had financial troubles because he had to retire prematurely and had to take care for his child. Occasional dose of Psorinum C 1000, in intervals of several months, reestablished his mood and improved his overall quality of life, provided more vigor and balanced his psychological state. For more than one and half years he no longer has taken any conventional medicine; he even considered reentering the working process. In May 2001, an MRI-scan showed no change concerning the tumor. No signs of growth or malignancy of the remaining tumor. June 2003: MRI, no change. September 2003: The patient is in good condition. His father died in an accident. (Concerning the Aurum-series, this is a fact worth mentioning). February 2004: He has problems with the scar, the clips dislodged, he requested further homeopathic treatment. June 2004: The CT showed glial formations in the area of the temporal lobe. No space occupation. MRI: glial formations in the left temporal region, a shrinking tendency is observed, the lateral ventricles are distorted towards the lesion. Plastic surgery was necessary to cope with damages of the skin resulting from surgery and radiation. Feb. 2005: the MRI revealed stable conditions. Note aug.2006: the patient with astrocytoma is still fine! After a period of paranoic symtoms, hyos M and XM helped to contol the symtoms, but plb-i FC 5M (after years) seems to cure the symptoms completely. Therefore the case is very interesting, also the pharmacy. Anaplastic Astrocytoma Grade III; infiltration of the basal ganglions. • General convuls. ; epil. ; ailments; aura; epigast. • Eye pain; stitching; right, extending to occiput. Brain tumor (KA): iod., plb. The professional position of the patient points to the Aurum-series: Leader, manager, he is in a complicated position with little space to maneuver, he is dependent – thus he holds only a formal function: Stage 14. Concerning his family, it is his mother who actually takes care of his child. Concerning both situations, privately as well as in his business, he holds a formal position (see figure 3). After operations, chemotherapy, radiation and homeopathic treatment, a remarkable improvement set in. Because of regression of the remaining tumor and the peripheral edema a third operation was not necessary. Patient refused further chemotherapy because of suffering from straining side effects, moreover he considered another cycle of chemotherapy as being only palliative. June 2004: the CT showed no progression of the tumor, glial scars, shrinking tendency of the lesion was observed. Feb. 2005: the MRI displays a stable situation (Fig. 4). This case could not be solved by computer-aided consultation. However, based on the analysis of the periodic table (JAN SCHOLTEN), and hints given by KAMTHAN’s repertorium, it was possible to find an appropriate mineral remedy. 1. for personal privacy, both dates and locations have been changed; however, it was done so without infringing on medically relevant facts. 2. see preface of the Organon; since hundreds of years cooks treat burns with candlelight, similarly a frozen limb has to be treated with snow – plainly spoken, both are truly homoeopathic treatments. 3. these FC-potencies are made from an especially designed and built potentizing machine used by the druggists Robert MÃƒÂ¼ntz (Salvator Apotheke (= Remedia), Eisenstadt, Austria). The use of FC-potencies produced in this way were used in this case for the first time. Back then, I asked Mr. MÃƒÂ¼ntz to produce a medicine of high quality. We decided to use FC-potencies. Since then, I have used such FC-potencies for about several years and can observe outstanding results especially in cancer cases. Allen TF: The Encyclopedia of Pure Materia Medica - Vol 1-12. New Delhi: B. Jain; 1986. Boericke W: HomÃƒÂ¶opathische Mittel und ihre Wirkungen. 3. Auf]. Leer: Grundlagen und Praxis; 1986. Hahnemann S: Organon der Heilkunst. 6. Aufl. Heidelberg: Haug; 1987. Hering C: Journal of LMHI: 1994. Kent JT: Repertory of the Homeopathic Materia Medica and a Word Index. London: Homeopathic Book Service; 7986. Kamthan PS: Cancer - Curable under homoeopathic treatment. New Delhi: B. Jain; 2004: 3-4. Payrhuber D: Krebs und HomÃƒÂ¶opathie. Salzburg: Eigenverlag; (vorauss. 2006). Scholten JC: HomÃƒÂ¶opathie und die Elemente. Utrecht: Stichting Alonnissos Publ. ; 1993. Scholten JC: Homeopathy and Minerals. Utrecht: Stichting Alonnissos; 1993. Schroyens F: Synthesis - Repertorium Homeopathicum Syntheticum 6th ed. London: Homeapathie Book Service; 1993. Zandvoort R: Complete Repertory Vers. 4.5, Software for Mac.